Summary: An episode with essential movements completely let down by its execution. The police have abandoned the Glades and things have gotten bad. One of Brick’s goons’ shakedowns is interrupted by Arsenal and Black Canary, and Sin sees the Canary thinking it’s Sara. Malcolm attempts to train Thea to kill to combat the League threat but she refuses to kill. Lance gives Arsenal police information on Brick in an attempt for Team Arrow to locate the crime boss’ headquarters in the Glades, noting that he knows the red hood is Roy. Felicity pulls from the evidence that the gun Brick used in a recent killing is the same gun used to kill Malcolm Merlyn’s wife 21 years earlier. Merlyn has tapped into webcams in the Arrowcave and hears that the man he killed to avenge his wife was not the right one. Realizing cellphone towers are out but Brick’s gang is still communicating with each other over walkie talkies, Felicity tracks RF signals and discovers Brick’s base of operations is the police precinct in the Glades. Arsenal and Canary raid the precinct but Brick eventually gets the upperhand. Just as he’s about to kill them, Merlyn intervenes. Merlyn offers to team up with Team Arrow but they vote against it. They decide to use the citizens of the Glades to fight back. Laurel recruits Ted Grant and Roy gets hold of Sin. The team confronts Brick, who reveals his army. They reveal theirs and a mob riot breaks out. Grant as Wildcat takes on Brick himself and gets mauled. 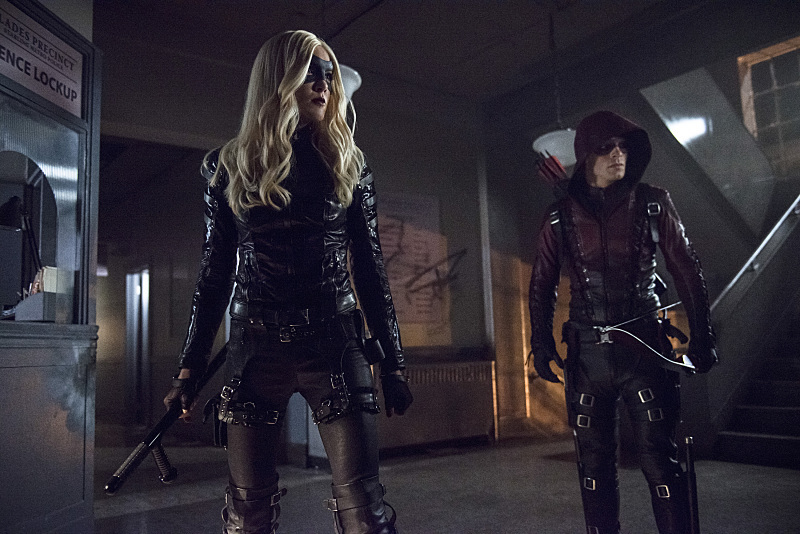 As Laurel attends to him, Sin realizes this Canary is not Sara. Malcolm then takes on Brick as he tries to escape. 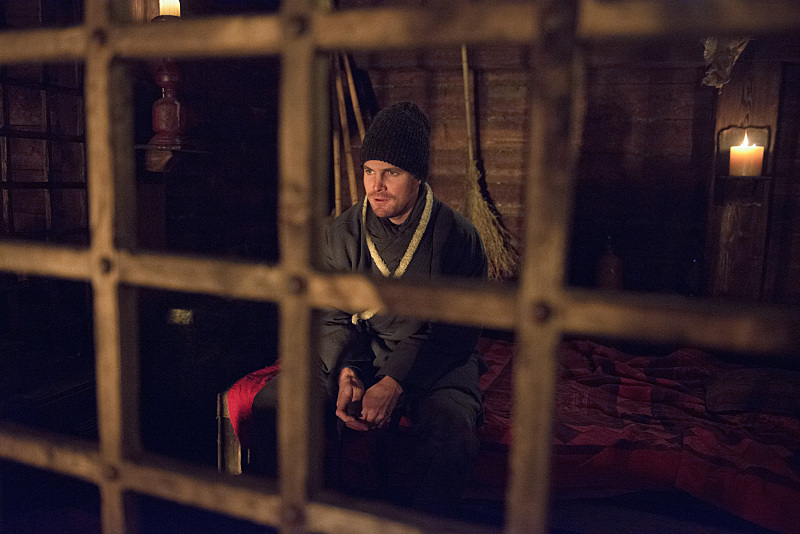 Meanwhile, Oliver leaves the cabin against Tatsu’s advice. She secretly follows him to keep an eye on him, but he calls her out. She helps him get to a road to get back to civilization. The Arrow arrives during the riot, to the surprise and thrill of the team. He confronts Malcolm to prevent him from killing Brick. Malcolm agrees. The Arrow addresses the citizens and tells them he won’t disappear again. The cops re-enter the Glades and take over. Sin talks to Lance and tells him that the Canary wasn’t Sara. Malcolm tells Thea he didn’t kill Brick and Oliver arrives to let her know he’s back. Oliver and Malcolm talk and he’s asks for the Dark Archer’s help in learning how to defeat Ra’s al Ghul. Oliver goes to the Foundry and thanks them for what they’ve done in his absence. He lets the team know he’s going to work with Malcolm. Felicity can’t believe what she’s hearing. Oliver tries to apologize to her for being gone so long, but she rebuffs him. In the flashbacks, Malcolm learns that his wife was killed. He has an associate learn who was responsible and confronts the man, intended to kill him. The man beats Malcolm up and walks away, but not before Malcolm is able to fire a gun and kill him. Feeling lost and angry, Malcolm leaves Starling and little Tommy to travel to Nanda Parbat to try to find peace and hone his anger into something stronger. Let’s just get this out of the way right at the top: This was just a hair on the good side of being an outright awful episode. After solid, if not necessarily exciting, build-up in the previous two episodes, this capper to the Brick trilogy offered a lot of promise. A ragtag group of heroes barely eking by but surviving on their gumption. The majority of Team Arrow’s work undone. 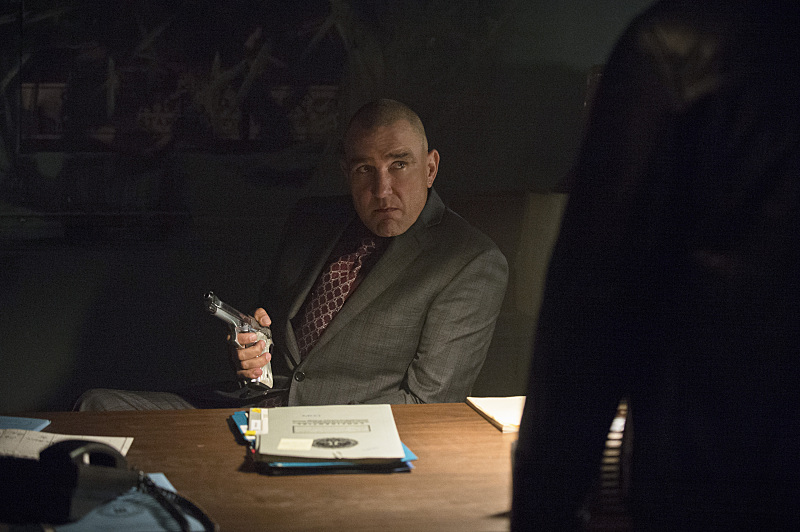 A crime boss blackmailing the scum of Starling City into doing his bidding to take over the Glades. (Though, even more than a year removed from the Undertaking, one can’t imagine the recovery effort has made that section of town worth “ruling.”) The allure of mob on mob action. The potential of Oliver’s return. 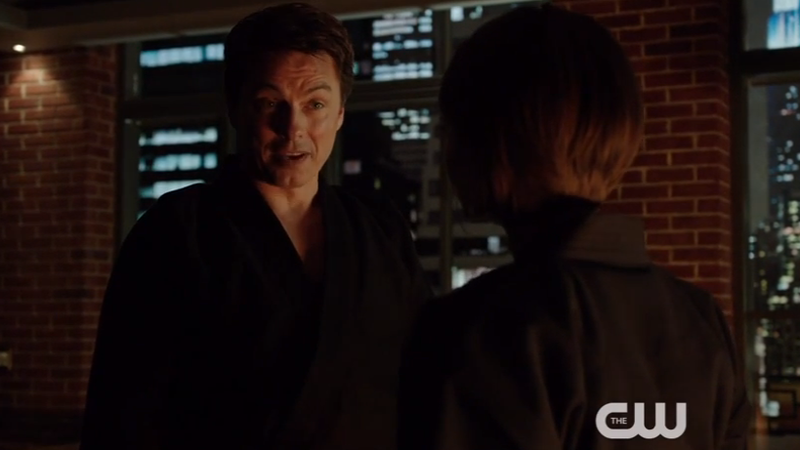 On top of all of that, a team-up with Malcolm Merlyn and flashbacks to his past. All should’ve been wonderful grist for the mill. Yet, this is what we’re left with. Due to other commitments last week, I wasn’t able to see the episode first run and had to catch it over the weekend. At times, an extra wait can be enjoyable. It either allows you to sit with your anticipation longer or to bypass the buzz, good or bad, that accompanies the live airing. You get to address the episode on your own time and terms and often get better perspective on it. At other times, such as this, your wait isn’t paid off. The episode does nothing for you, or worse. On occasion, it’s aggressively wasted and you find yourself, as I do now, not really wanting to devote much time to discussing such a disappointing offering. 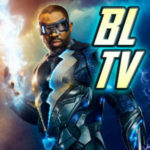 Arrow has a lot going for it, and when you often see praise such as “best superhero series on television” batted around, it’s been quite deserved. Knowing the stigma that often comes with such shows, it’s nice to have one you can parade in front of all those who regularly avoid such fare. A shining example to say, Look, this stuff can be as engaging and entertaining as some of the best TV has to offer. Then, you get an episode like this that makes you cringe as it lives up to all of the bad rap superhero shows usually get. A series of interesting ideas is bathed in substandard plotting, shoddy dialogue, and a seeming contest to see who could act the worst. That honor this hour goes to John Barrowman. As a Barrowman fan for a good number of years now, I’ve come to enjoy the high-wire act that his performances often involve, tipping precariously between being boisterous and lively and being over the top. It’s a particular style that works for him, and one of the main factors is that you often feel that it is rooted in some strong measure of believability on his part. Here, just about everything Barrowman does rings false, as if he just flat out isn’t engaged in any of the activity going on during Malcolm’s flashbacks. There’s little belief behind it, and as a result, everything becomes forced and operatic. The audience is left with little feeling behind his motivation to go after Brick when that rage should be pulling us along with him. We understand why he’s doing it, but there’s no fire and no conviction. That makes the largesse of his performance in every scene stand out even more. It also brings into glaring focus another element of the series that just isn’t working: Thea. We were somewhat excited at the start of the season that the two characters who had gotten the short end of the stick — Laurel and Thea — were now getting some competent and compelling storylines to involve them in the action and narrative. While Laurel’s story continues to progress, Thea has been left in a lurch, a complete non-factor who is nothing more than a gambling chip between Oliver and Malcolm. The DJ romance is a fizzle with the bite now taken out of it by the obvious reveal of the man as a League spy. Even the discovery that Thea was Sara’s killer, albeit brainwashed, turned out to be anticlimactic. It served to undercut any kind of importance the character really has on the proceedings except when it is convenient for other characters to mention her. Unless Thea is brought up to speed with everyone else, it might be better to just remove her entirely. And even then, it’s not clear an actively-involved Thea will really offer much. Coming in a close second in the race to the bottom this week, much as it pains me to say, was our lovely Emily Bett Rickards. Again, here was a case where there felt like little conviction behind what Felicity was arguing throughout the evening. Perhaps this was just an off week. Perhaps energies were all conspiring to throw nearly everyone off their game, or something was in the water. With Felicity being the main counterpoint to Malcolm’s assistance, it felt more motion than emotion. Her rants against the Dark Archer came off rote and expected, and sadly they were too often delivered in such a shrill fashion that a reach for the fast-forward button became a constant while enduring the hour. It’s not the first time it’s happened on the show; they struggled at times with Felicity sounding those harsh notes last season. The character and actress are so enchanting, though, that one has to be disappointed whenever they give her material and/or direction that ends up this way. The most unfortunate aspect is that Felicity has a very distinct and justified point in telling Oliver to go to hell upon his return. Oliver can be quite thick-headed when it comes to his convictions, often not allowing himself to see other ways through problems until he’s forced into a position where he must. He’s also a survivor, and he’s learned to adapt by embracing the evil things he’s presented with to try to turn them to his advantage. That’s exactly what employing Malcolm as an instructor proposes, and in many ways it’s a smart move. But it does run up against the moral and ethical high-ground he’s spent the last couple of years establishing, so it makes a great deal of sense that Felicity would bristle against the suggestion. If only the whole interaction were delivered in a way that didn’t make one want to shed senses to escape pain, it would’ve landed stronger. Even Stephen Amell isn’t immune to the acting adversities. Oliver still has a significant wound he’s mending and that does something to one’s physicality that Amell captures quite well. Yet, there’s supposed to be a tender, raw quality to the way he interacts with others to portray that broken and healing condition that unfortunately comes off slight and aloof. He frequently seems bemused throughout the hour, and it ends up making Oliver somewhat of a whispy presence. If one were being generous, you could say that it read almost like a ghost of Oliver back to find new life and purpose, but it doesn’t feel either that tactful nor that artful. Speaking of lacking tact, the rumble between Brick’s crew and the Glades denizens that rally behind Team Arrow is a bit of an editorial mess. It appears they actually got a fair amount of extras to attend to give the clash some real weight, yet the way it’s shot and cut together end up losing much of the impact. That’s only exacerbated by the inexplicable arrival of the Arrow. What should be a triumphant return gets lost in the shuffle, and Oliver’s prescience about what exactly is going on when he shows up further erodes credibility. What becomes the most cringe-inducing bit of the hour is, ironically, supposed to be its most heroic. The Arrow stands atop a tall vehicle, orating to the empowered throng about their honor and pride and cohesiveness as a community to band together to protect it in his absence. It’s yet another false moment because it runs against the grain of what the Arrow is. Sure, he can be inspiring, but far more in his actions than in his words. Far more in his deeds than in seeing him do the work. The comic Green Arrow would actually feel at home making such a speech, a Robin Hood occasion to lift the masses out of the tyrannical doldrums. This doesn’t fit the television character at all. Oliver even made that distinction with Barry Allen, letting him know that the overt optimism of his cause is better served by the bright and colorful world of Central City and its hero. If this is what rebirth got him, I’m not sure if the Arrow is necessarily going to fit comfortably in the world they’ve created for him going forward. The less said about the punctuating zipline arrow exit the better. What should have been an absolute goldmine in the flashback storyline for Malcolm is instead relegated to inconsequential status. I hesitate to ever really critique performances by child actors because it is honestly very rare to find one that truly offers a natural, believable portrayal. That’s not an outright dismissal of young performers, just an acknowledgement that many lack the skills, experience, and bearing yet to really embody a person without feeling like they are trying. 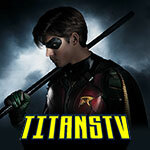 The young actors portraying Tommy, Oliver, and Nyssa don’t offer enough meat on the bone to invest in the story, and the aforementioned lack of conviction on Barrowman’s part undercuts his effectiveness. What’s more sad is that we really don’t get much more insight and shading into Malcolm’s past that what we’d had before the episode. This is becoming a common theme of the flashback parts of the episodes this year. About the only thing that substantially works about the episode is Sin approaching Quentin Lance to tell him that the Canary is not Sara. What’s frustrating is that there are plot movements here that are not out of line. They are next steps necessary to move the story forward. It’s all just told in a sub-par fashion. That seems to reflect the overall frustration on this season as a whole. We’ll probably take some time in the not-too-distant future to sit down for a roundtable discussion and really air out thoughts and feelings on the season. In brief, I just can’t escape the glaring fact that the quality is all over the map this year. It feels as though they are struggling with the weight of what they’ve built over the last couple of years, and the result is a disheartening shamble merely existing rather than teeming with life. More than displeasing, “Uprising” is actually quite angering because we know the show is better than this. On paper and in concept, “Uprising” is a solid conclusion to this Arrow-less Brick arc, while offering new steps to where the season will go. Throw in lots of John Barrowman and every character playing a key role, and there’s the capacity for one of the best episodes of the show, ever. So it’s extra disappointing that this episode turns out to be rather underwhelming, aside from some breakout bits. There are good things happening here, but whether it’s the direction, editing, or just a general lack of ambition, “Uprising” doesn’t live up to everything it teases, and it’s a big shame. The final battle in the city is the biggest offender of the episode. There are things we can overlook for the coolness factor in a show like this; it’s silly to have Brick’s lackeys apparently hiding behind a building just so he can pull them out in a confrontation, but it’s such a cool moment that it’s excusable. And we have to be willing to accept some lackluster battle scenes from time-to-time (and Arrow has had so few failures in the action department that it’s more than made up for potential missteps.) But as soon as the riot starts, things are strangely edited and paced, as if the final scene was hastily thrown together at the last minute. There are really cool things within — Wildcat in costume, Sin back and doing lots of stuff with a bat, Diggle with a friggin’ assault rifle. But then there are bits like Laurel bowing out of the battle to kneel by Ted’s side for a stupidly long time when he’s clearly doing okay. Or that the Arrow’s triumphant return involves one arrow being shot, and then a really awkward and abrupt speech on a truck when we never even got to see the battle actually end. There’s a lot of build-up without much catharsis, and that’s a bit frustrating after a couple of exceptionally good episodes preceding. On the upside, Quentin gets quite a bit more to do. There’s a subtle, but easily misconstrued acknowledgement regarding his knowledge. His being able to deduce Roy’s identity so easily is played as a joke, and a wonderfully funny one. But it can’t be a coincidence that it happens in the same episode where Sin lays out how this Canary is obviously not Sara. It’s not spelled out for us, but it heavily infers that Quentin purposefully has blinders on when it comes to Sara, in the same way that we’ve posited he only claims to not know Oliver is the Arrow because he doesn’t want to know. In the case of Sara, Quentin has to constantly deal with the fact that his dead daughter isn’t dead and is popping in and out as a dangerous assassin. Of course the guy’s not going to want to think about anything else going wrong with her. So even though something has clearly been up, Quentin is going to keep optimistically thinking everything’s okay, ergo assuming Sara is just out there being a hero like usual. It’s tricky, of course, because it’s very easy to play this too far and just make Quentin look like an idiot. But since Sin has made Quentin look a little closer, we’re thankfully getting some movement on that front. The Malcolm flashbacks are fine, but they don’t offer anything we didn’t already know, instead visualizing monologues Barowman has already delivered with aplomb in the past. Arrow has done this sort of thing before and succeeded, like putting to screen the plot points we mostly knew of in “The Promise.” Malcolm’s flashback works best because of Barrowman’s consistently captivating performance, perpetually chewing the scenery so hard that his jaw should be sore, but doing it with such charm and confidence that it feels natural for the character. And there’s an interesting throughline in it, showing Malcolm’s morbid yearning to understand the mind of someone he views as a complete monster. We’re missing some steps, but it seems logical that Malcolm’s fascination with a type of person he completely hates could be twisted into a complete, wider disgust for a specific kind of vermin. And even then, the episode hinges on the nature of his intentions; as much as he hates the underbelly of the Glades that killed his wife, he wanted The Undertaking to be a way to get rid of those vermin to help the good people there. It’s still a pretty clearly messed up view of the world, but the best part of these flashbacks is detailing how completely broken Malcolm is. The only reason he didn’t spin out of control was because of the League of Assassins, which brought him to the cold and calculated but still volatile and insane man he is now. But again, it’s stuff we already know, and while it’s nice to reaffirm and talk about it — it’s great in concept — it’s not terribly interesting watching on screen. It does, however, set a nice backdrop against Team Arrow’s debate over whether or not to accept Malcolm’s help, easily the best part of the episode. In the past, Roy might have remained silent and went with whatever the group decided, but Oliver’s absence has forced these characters to take charge in one way or another. All stances are in character — Roy wants what’s best for the Glades and is naturally swayed by Thea; Laurel is willing to win by any means necessary if they can keep it in control; Felicity is staunchly against involving a terrorist; and Diggle is the wild card, but one that ultimately makes the right and final decision. That makes it all the more surprising when Oliver, Malcolm’s biggest hater, agrees to partner with him. And “Uprising” is very, very good at laying out all aspects and perspectives of Malcolm, so Oliver’s choice remains utterly ambiguous. For every sympathetic flashback or monologue or rationalization, a character will mention that he killed 503 people, killed Sara, framed his own daughter, and enacted a gambit that got Oliver temporarily killed (albeit by accident.) The show itself is making no clear stance on this issue just yet, so we in the audience can either reluctantly agree with Oliver’s decision like him, or vehemently reject it like Felicity. That leads to a whammy of a final scene, which makes up for much of the clunkiness of the rest of the episode. Arrow has sometimes had trouble balancing Felicity’s surplus of roles on the show, juggling comic relief/love interest/voice of reason/heroic support/emotional antagonist in ways that sometimes clash, especially last season. But this is Felicity firing on all cylinders, a smart and self-aware woman who deserves something better than the emotional wringer Oliver has put her through. Acting outside of the impulses of “Unthinkable” and “The Calm,” and in the context of falling for Ray while losing and subsequently getting Oliver back, it’s become more clear what kind of wringer that has been. Felicity’s impeccably written and delivered final monologue pinpoints just how utterly messed up things are when it comes to Oliver’s life. And even then, it’d be easy to disagree with her; from Oliver’s perspective, things are dire enough to justify these means. As soon as the Arrow was out of the picture, Starling spiraled into chaos, so Oliver must be doing something right. It’s suddenly a tug-of-war of ideologies between these two characters, and that’s turned a typical forbidden romance plot into something very different. “Uprising” is a bit disappointing, but as evidenced by the final scene, it spawns incredibly interesting and exciting dynamics to propel the rest of the season.